Before Lindy West’s readers knew what she looked like, the negative comments her work received centered on the impersonal: the content of her pieces for the Seattle weekly publication The Stranger, her ideas, her style of writing. 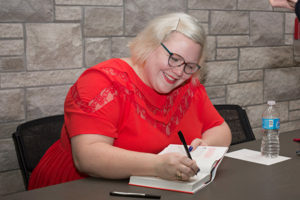 Author and activist Lindy West signs copies of her book after her Women’s History Month lecture at Columbia College. She remembers the first personal one, the first one that referenced her appearance. It hit the internet on June 9, 2009, at 11:54 p.m. They haven’t stopped for the past eight years. For West, a feminist and body image activist who uses her writing as a megaphone for these issues, internet “trolls” — commenters who post abusive messages about other people online — are a way of life in her workplace. Her experience is not unique among female writers. Earlier in the day, during a session with Columbia College associate professor of history Dr. Tonia Compton’s Women’s History class, West worried the stream of abuse reserved for women has a chilling effect on younger writers seeking a platform to express themselves. She heard from students about confronting trolls, from arguing with them to taking down Tumblr microblogging pages so they wouldn’t be able to access personal information. Compton, who chairs the Columbia College Women’s History Month Committee, felt West’s voice was an important one to include because of the prominence she has earned with her work and the abuse she’s endured from being an outspoken woman along the way. During West’s talk in Bixby, which preceded a question-and-answer session and a reception at which West signed copies of her book, she outlined several recent examples of sexism highlighted in popular media, including an experiment undertaken by two co-workers — one male, one female — in which they switched names on their email signatures for a week to see what happened. The man suddenly found his clients rude, condescending and unwilling to take his advice. The woman had a much easier time than she was used to experiencing. West has a national following with her writing, two more books in the works and is in the midst of developing a TV show based on Shrill. She feels the privilege of being able to lend voice to the voiceless. She urges more people to take that step.